The world is buzzing about the Galaxy S3 smartphone, but at Galaxy Tab blog, we are more eager to get our hands on the Galaxy Tab 2 10.1. The tablet is now on pre-order for 400 dollars on retailers like Office Depot. Find the specs of it after the break. Specs of Galaxy Tab 2 10.1 go like this Android 4.0 ICS, 1280 x 800 pixel 10.1 inch display, 1080p video output, Bluetooth connectivity, micro SD memory card slot to expand internal storage, better speakers and up to 50 GB of free space storage on Dropbox (first year only). 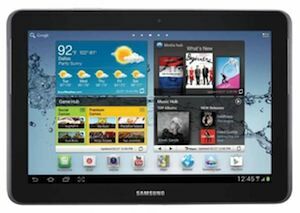 Read the Samsung Galaxy Tab 2 10.1 review to find out more about it.